Item description: A. G. Magrath was the confederate governor of South Carolina during the Civil War. 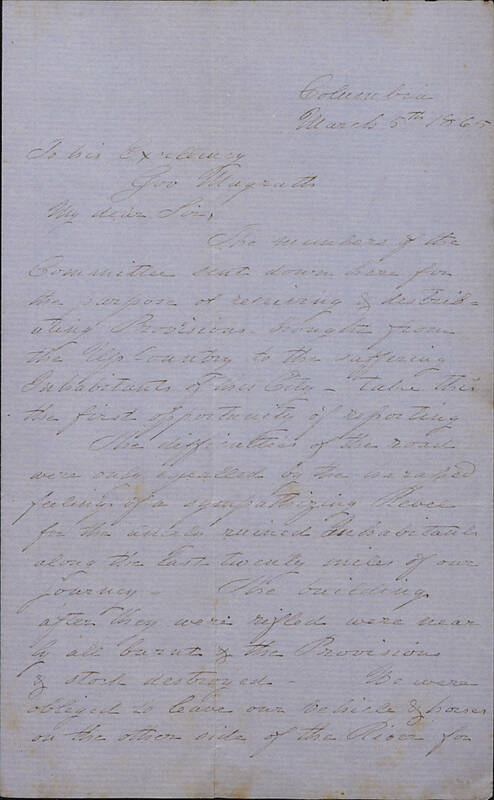 This letter reports back on relief efforts sent to Columbia after it was burned and remarks on both the condition of the town and its people, as well as the success of the relief. It also notes difficulties encountered en route to the city that might hinder future aid attempts. Item Citation: From Folder 2, in the A. G. Magrath Papers, #467-z, Southern Historical Collection, The Wilson Library, University of North Carolina at Chapel Hill. 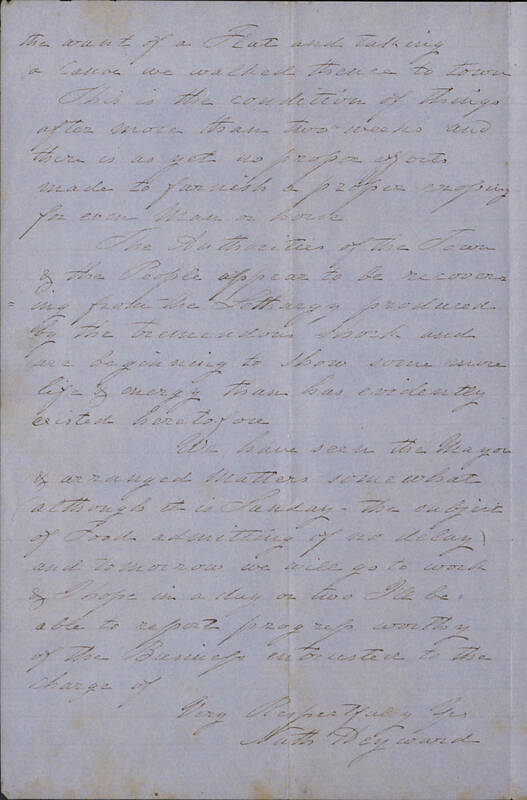 The numbers of the Committee sent down here for the purpose of receiving & distributing Provisions bought from the Up Country to the suffering inhabitants of this City – take this the first opportunity of reporting the difficulties of the road were only exceeded by the harassed feeling of a sympathizing Rebel for the utterly ruined Inhabitants along the East twenty miles of our journey. The building after they were rifled were nearly all burnt & the Provisions & stock destroyed. We were obliged to leave our vehicle & horses on the other side of the River for want of a Flat and taking a chance we walked thence to town. This is the condition of things after more than two weeks and there is as yet no proper efforts made to furnish a proper crossing for even Man or horse. The Authorities of the Town & the people appear to be recovering from the Lethargy produced by the tremendous shock and are beginning to show some more life & energy than has been evidently existed heretofore. This entry was posted in Southern Historical Collection and tagged A. G. Magrath, aid, Civil War, Columbia, governor, relief, South Carolina. Bookmark the permalink.